This is another episode of “Sing Along with the Landt Trio” of Karl, Jack and Dan. This program has a little extra interest to it: it’s Army Day! The wonders of the internet! After I posted today’s recording I was able to get in touch with Skip Landt, whose father was part of the Landt Trio. I asked him to share any memories or stories about his father and the group. Here’s what he had to say after hearing this recording for the first time ever. Most of the talking and joking on this broadcast is my dad, Dan Landt. Hearing the program for the first time since it went off the air (in 1948!) was a thrill. But I was amazed at how informal and unrehearsed the “filler”between songs sounded. What you are hearing was my dad’s “radio voice,” not the way he spoke at home. As other broadcasts become available, I’ll be curious to hear if they all had that “put on” quality or if he was sometimes more relaxed. The trio got started when my dad returned to Scranton, Pa, after serving in WW1 and later doing various jobs; most immediately, selling inflatable “bubble boats” in Florida. In 1927 he was 31; his youngest brother, Jack, was 16, with Karl (the golden voice) in between. Jack and Karl were on the local radio station singing brother duets, sponsored by a battery company (the full story is at landttrio.netfirms.com). Over their mother’s objections, they went to New York City to get into vaudeville, not realizing that it was dying, but instead became pioneers of early radio. They had a number of programs, first (I think) on NBC, then CBS. These included “The 8:15” (in those days an “early morning” program), and “Take it Easy Time,” along with many others including “A Violet for You” and backup singing on the Bob Hawk Show. 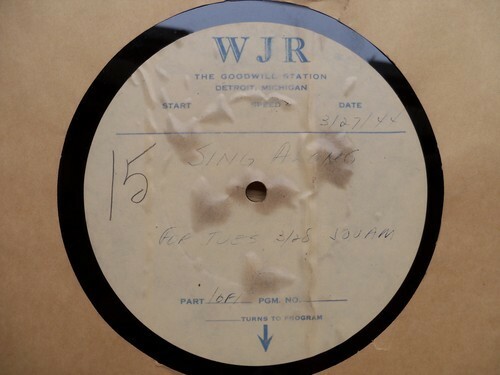 But their longest running was Sing Along with the Landt Trio, the first “sing along” program on the air—long before Mitch Miller. It was also, in an extended format, one of the first shows to have game segments. In “Dig for silver” they’d have a fishbowl of coins — if an audience member got the right answer, she’d get to dig in and keep whatever she came up with. They had other ”name that tune” games with bigger prizes. What I recall best, visiting such shows with a studio audience, was the way they would get applause. Not only was there a big “APPLAUSE” sign held up for all to see, but a staff member also would hold up a large stuffed animal — which went to the person applauding loudest! And that’s why I’m doing this blog: so people can reconnect (or connect for the first time) with the music and memories contained in these recordings. Thanks, Skip.